Run a smooth PC with System Mechanic Professional. 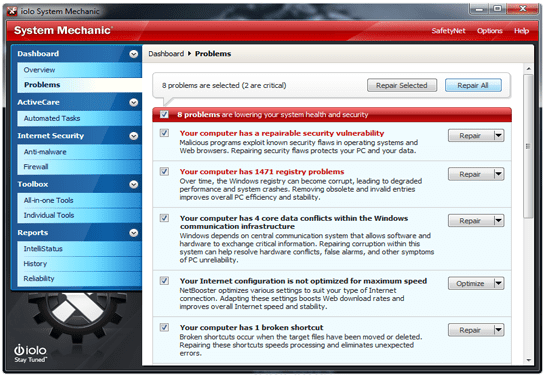 System Mechanic includes five different products that provide computer tuneup and maintenance, antivirus protection, up-to-date drivers, file backup and recovery. Whenever my friends tell their PC is running slow I recommend them to run a deep analysis with System Mechanic to FIX all sorts of issues. After which their system will run at lightening speed once they click “Repair All”(As shown in above screeshot). It’s an user-friendly tool with which the user can clean up the excessive system clutter, repairing registry problems, optimizing startup configuration, or backing up the registry. How to Get FREE License Key of system Mechanic? Just participate and win a FREE License key. To enter into giveaway contest all you need to do share this post in Facebook or in Google plus or Retweet this post and add your shared link in comments below.Thanks to Mr. Jack Follmam of iolo technologies, LLC for giving FREE License key for Computer Tips & Tricks blog readers. 🙂 The net price of each license key is $39.95. The best of all-in one tool. Thank you very much for this giveaway.Please count me in too.